Alabama jail, Burmese python: Inmate sues over incident after which guards were fired. 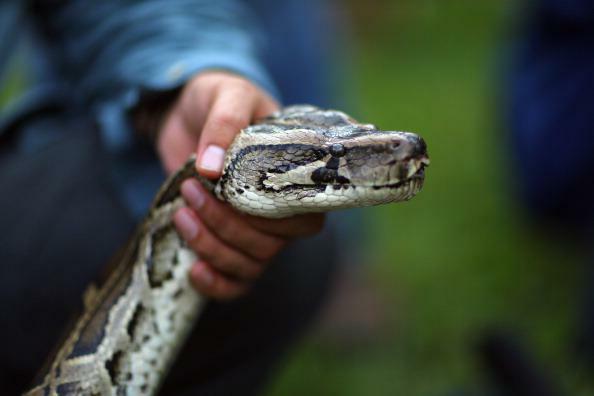 A Burmese python in Davie, Florida in 2013. According to the lawsuit, Redding claims Glenn brought a yellow Burmese python described as being 6 to 7 feet long into the jail. He says Glenn and Mittlebach had the snake in the jail kitchen where he worked as a trustee on Aug. 11, 2013. Redding told them he was afraid of snakes and didn’t want to be anywhere near it … Several hours later, following breakfast, Redding said he went back to his bunk to take a nap. Redding claims when he woke up Glenn was holding the snake within inches of his face. As anyone who has ever been responsible for reading the unsolicited letters sent to news organizations can attest, prisoners make a lot of wild claims. But Redding’s allegation has credibility: Dale County sheriff Wally Olson confirmed to a local NBC affiliate that an incident similar to the one described in the lawsuit had taken place and that Glenn and Mittlebach were fired as a result.